When a band make you smile from ear to ear with each and every release they share, you know they're doing something right. From relatively unknowns to one of the most popular modern day band's worldwide, The 1975's rise has been nothing short of magical. 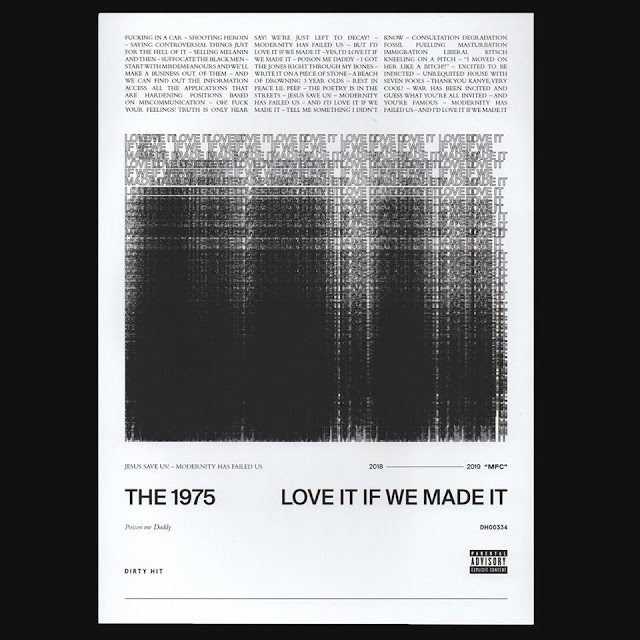 As they prepare the release of their third studio album, 'A Brief Inquiry Into Online Relationships', ramping up the best visual campaign I've seen with their posters and artwork, the Manchester group have now unveiled their second single, Love It If We Made It. Following on from Give Yourself a Try, a massive call to arms that implores you to invest in your own interests first, the band turn up the heat as they melt together their stylistics from across all their previous releases. It sounds familiar yet all the time pushing the boundaries of which it confides with a unique vocal delivery and driving melody line. As it breaks we get a funkier taste of their 80's influence as samples cascade together across its bassline and jazzy guitars . Take a listen for yourselves below. 'A Brief Inquiry Into Online Relationships' will be released in October.